It takes about 5 minutes drive from the center of Ubud. 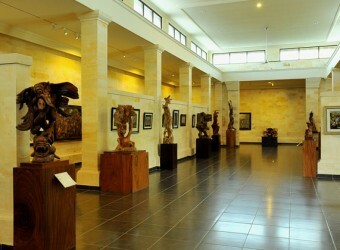 Among 4 museums in Ubud, Puri Lukisan Museum which was built in 1956 has the longest history. In 2 buildings of the permanent exhibition, there are drawings of Balinese artists who appeared after 1930 by periodical order and different styles. The most interesting thing is sculpture. I wondered is it for sale? I just could feel that all historical things. Not only paintings, but there are also various sculptures here. I have learned something.